For several weeks I have been searching salvage stores, antique shops and other likely looking places for an old window with some character and hopefully glass in all it’s panes. I have wanted to use it as a frame to showcase pictures of one of my favorite old barns – Grandpa Roy Smith’s barn in Hayward. I only found a couple windows at one shop, priced over my budget at $50 each and they were missing glass. But last weekend I went north to visit Julie in Gainesville, wondering whether I might have time to poke around up there. It is not as much a shopping venue as our beach towns and it is within reach of more rural areas where old houses abound. On Friday I had time to myself and decided to investigate Alachua. I chose it because I liked it’s name. It’s about 7 miles from Julie’s house – an easy jaunt. However as I asked around, no one there knew of any places of the kind I was looking for. My last stop was a small garden/gift shop with Christmas decorations going up in the window. The owner didn’t know of any salvage stores either, but when I mentioned I was looking for old windows she said she had a couple at home that she would sell – for $15 each!! I could hardly keep myself from dancing around in front of her. She agreed to bring them the next day and I promised to return for them. Julie and I did go back and I ended up buying three wonderful old windows – just the kind I had been praying for. They have distressed paint in several layers, glazing that’s missing in places and so much character. I can only imagine the faces that may have peered through them in the past. 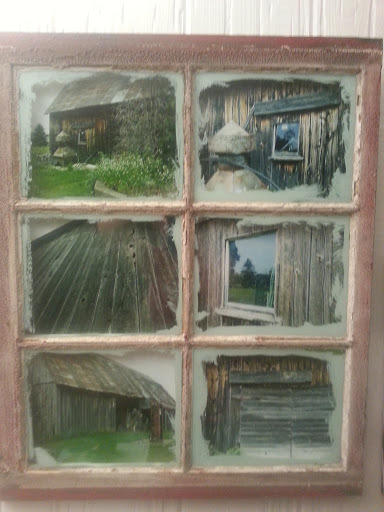 I chose this one in particular to display my barn pictures in because it has red paint showing through on the frame and a curious paint on the glass. The paint is white on the outside but on the back side of the glass it is a pale greenish gray, and that is the side that I have showing. (Whoever painted the outside last was very messy but I love the way it frames the pictures.) The wood in my barn pictures has some of the same hues of red and green as the window frame. They go together so well. I LOVE it! It is really a beautiful piece!